Wednesday night, I was hanging out with Jacque and Evan. I think I still have sand in my cracks. 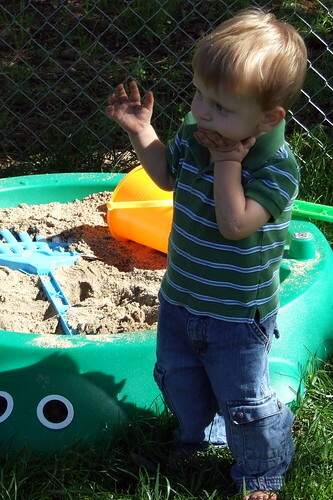 Evan has a sandbox, now. By the time I got there, he already had dirt deep under his fingernails. He really needed a bath. Just as Jacque got him all bundled up in a towel after his bath, the phone rang. She rushed across the hall to the bedroom and put Evan on the bed so she could answer the phone. "Please don't pee on my bed," she begged. The kid went crazy! Who doesn't when they're all naked in a big bed? He would burrow under the covers and then pop up, growling like "Surprise! Bet you didn't know I was under there!" He would whisper babbles to Jacque and then giggle. He was really funny and in such a good mood, we didn't want to go get him dressed. His mood can change in an instant! "We'd better get you out of here. It's been a long time without a diaper." And as if on cue, well . . . I think you know what happened next.